Signing contracts correctly is important, not just as a matter of dotting i‘s and crossing t‘s. How a contract is signed can affect whether it’s enforceable and who’s on the hook. Here’s a basic “how-to” on signing contracts. Only legal persons are parties to contracts. Legal persons can be humans (which are legally known as “individuals”) or corporations, limited liability companies, and other entities. As a general rule, if an entity wasn’t formed by filing a document with the Secretary of State, individuals are going to be on the hook for its contracts. This consulting agreement is dated January 9, 2013 and is between ACME LAW FIRM, P.C., a Missouri professional corporation, and THE CONTRACTS GUY, INC., a Missouri corporation. This consulting agreement is dated January 9, 2013 and is between LAW FIRM, P.C., a Missouri professional corporation, and BRIAN ROGERS ENTERPRISES, INC., a Missouri corporation doing business as the Contracts Guy. It’s not always easy to determine a business’s correct legal name. On one end of the spectrum, an unsophisticated business owner might not have a clear grasp of the legal effect of a fictitious name or might not understand that his or her sole proprietorship doesn’t have a separate legal existence from the business owner. On the other end of the spectrum, large corporations often do business through hundreds or even thousands of affiliated entities. Determining the correct entity to list as the party to a contract can be a daunting task for a business person, as well as the legal department. I always go to the records of the Secretary of State for help. A company can be found in the records of the state of its formation, its principal place of business, and often other states where it has a significant presence. The records of most states are searchable online for free or for a nominal fee (Texas nickels-and-dimes you and Delaware searches can really lighten your wallet, while Missouri and probably most states are free). At a minimum, a simple search will usually allow you to determine the exact legal name of the entity, the state of the company’s organization, and the name and address of its registered agent. Sometimes you can find much more information, such as the identity of the company’s officers and directors, whether the company is in good standing with the state, and even copies of its formation documents and annual reports. Because entities can only act through humans, it’s important to make sure that the human agents actually have authority to bind the company. While concepts such as apparent authority can sometimes bail you out of an unfortunate situation, it’s imprudent to rely on them. It’s a better practice to do enough due diligence to ensure that the signatory has actual authority. In a very important transaction you’ll want to review the counterparty’s corporate documents to make sure the signatory is authorized by the company to sign the contract, as well as have the corporate secretary provide a document that certifies that a specimen signature is authentic. But that’s overkill in most commercial contexts, so basic due diligence is usually sufficient. Common sense can also help: it’s more likely that a company’s officers have authority to sign contracts for the company than the mail room person, and the president is more likely to have authority than the corporate secretary. Katie Lane, who moonlights as a lawyer to small businesses and freelancers, has an excellent video on her Work Made for Hire blog, “How to Research a Company on the Interwebs,” that takes you step-by-step through basic due diligence, including searching the Secretary of State’s records. If you haven’t seen it, you should take a look — or at least skim the transcript. Here are examples of signature blocks for different types of companies. Image credit: Shutterstock. Image may not be copied or downloaded. I tweaked the signature block examples to conform to MSCD2 4.25 and 4.27: “Nothing meaningful is gained by … noting after the entity name the entity’s jurisdiction of organization” and the title goes under the name. Ken: I noticed that in your example in MSCD2 of a signature block within a signature block, to be used when a signatory to a legal-entity party is an entity, the company name of the signatory entity isn’t in all caps (Sample 9). Is that intentional? Yes: I use all caps only for the entity that’s party to the contract. I confess that I haven’t had the heart to read this post closely. I’m in paranoid post-galleys, pre-publication mode: if I’ve f*cked anything up, I’d rather find that out in, oh, six months! That’s the way I do it now…..
Vinny: I’m not a fan of those provisions. The signatory is either making the representation on behalf of the company, in which case it’s a chicken and egg problem like you say, or he or she is making the representation as an individual. So the former is probably meaningless, and I doubt the latter is very often the intention. I also doubt many courts would enforce such a representation against the individual. Missouri, in particular, isn’t very receptive to arguments that a signatory who signed a contract on behalf of a company also signed it in his or her individual capacity, unless the person signs it twice or it’s otherwise crystal clear that the individual intended to be on the hook (at least in the context of a guarantee contained in a commercial contract where the issue tends to come up). That said, I haven’t researched the issue specifically, so I’d welcome the input of someone who has. Brian: If the contract requires a notary block then the language in the notary can state that the individual is signing “on behalf of and with the [actual] authority of Acme Corporation, Inc.” Additionally, if authority is gravely important, one can have the Company prepare a resolution authorizing the transaction and authorizing John Doe to execute the contract on behalf of the Company. But in the case of the notary block that’s a representation made by the notary, ie that the notary has at least made some inquiry into the bona fides of the document signer. That’s different than the signer itself making that representation. I’ve also always wondered about a rep that the signer has capacity to contract. If that’s actually true it doesn’t add anything. If it’s false then you can’t sue for the breach of warranty because the contract wasn’t real to begin with, which is a prerequisite to suing on the contract. Yet more fluff we must destroy from our forms. Great post Brian, this is an issue that gets way less attention than it should. I can’t help to think signature blocks are a thing of the past. A practice formed in a time when contracts were on a piece of paper that you had to sign at the bottom (thus, the line). Name was necessary since sometimes you couldn’t understand it from the handwritten signature. As per Title… I suspect another thing of the past, where you just used to add title with everything (Mr., Mrs, Dr, etc). I can go further. Titles are not really necessary even when the same person needs to sign under different hats, e.g. as Director and Secretary. It’s silly to make the same individual sign twice. Rather than make people feel stupid, why don’t simply declare the two hats in the lead-in, if you really really have to? TL;DR I think some space and ink can be saved in regards to signature blocks. This will spare also time and headaches spent in the administrative figure out people’s exact title. I spent a bunch of billing time on this useless details. For contracts in particular, you really only need to have the authority, the law really doesn’t care about your formal title. I’d spare people also “signature blocks within signature blocks” that can be plain confusing. Happy to be contradicted of course! Veronica: You’re right that it’s a person’s authority to act on behalf of the company — rather than their title — that’s important. And while the common form of signature block isn’t a legal requirement, it does succinctly identify the person signing the contract and in what capacity, so I think it’s useful. 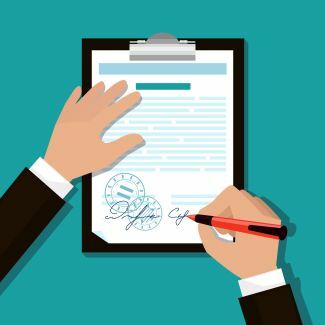 Without a legible identification of the signatory, it could be impossible to prove that a contract was signed by a company’s authorized agent, which would be fatal to an action to enforce the contract. Whether a contract is signed manually or electronically, you have to be concerned with authentication of the signature, as well as being sure the signatory is authorized to act on behalf of the company. With paper contracts in a routine commercial context, it’s common practice — and probably usually sufficient — to make sure the signatory is an officer or otherwise appears to have authority to sign the contract. And signatures aren’t generally authenticated — you just trust that the copy that shows up in the mail or the email was actually signed by the person listed as the signatory. There are ways to authenticate signatures, though, such as having them notorized. I do think it’s vitally important to be clear about whether a person is signing a contract as the agent of a company or as an individual. It’s certainly important to the individual because confusion on that point could leave them on the hook for their employer’s obligations. Sometimes a person signs a document both as an agent and as an individual. It’s not uncommon, for example, for supply agreements to contain a clause whereby a company’s owner agrees to personally guarantee the company’s obligations under the agreement. That person is usually an officer of the company, as well as an owner. Since the individual is usually not a party to the contract, it’s difficult to show the clear intention of the signatory to take on personal liability, which courts require, without having the person sign the contract twice. Veronica: Signature blocks within signature blocks (within signature blocks) are vitally important for establishing the proper party legally responsible for the obligations in the agreement as well as demonstrating actual or apparent authority. Proper indentation and use of “By” and “the [general partner] of X” for each sub-block should ameliorate any confusion. I see your point, but can it be moved elsewhere than nested lines that few people will format the right way? Thanks, Bill. Always good to see you around. Keep up the good work in Florida! This is my first comment here, though you may have seen me polluting Ken Adams’s blog with trivial remarks. I think basic Delaware searches are free. These normally give you what you need to know about a company’s name and place of incorporation (at least, whether or not it’s Delaware). New Jersey, though, will cost ya. Canadian federal searches are free, but Ontario’s are not. On signature blocks, I don’t think it’s necessary to identify someone as a sole proprietor in the signature line if the fact that the business is a sole proprietorship is identified in the company name and it’s the same as the signer’s name. For example, Brian Rogers d/b/a The Contracts Guy, by Brian Rogers, should tell the whole story. As to LLCs, don’t forget that these come in two flavors, manager-managed and member-managed, so the signatory should be identified as manager if the former and member if the latter. Vance: Thanks for stopping by and contributing to the conversation. You’re right about the limited information you can get from Delaware for free. I overstated the impact on one’s wallet slightly, but if you want more than very basic information, it’ll cost you more than a couple bucks. As far as LLCs, I opted not to complicate things by getting into the two types of LLC management, but you’re right … if, for example, your diligence indicates that the counterparty is a manager-managed LLC but the signatory is signing the contract as a member, you’ve got a problem. Also, LLCs can have officers, plus non-officers of all companies can be authorized signatories. I also didn’t provide a trust example. Maybe I’ll do a follow-on post. Brian: In states that have authorized series LLCs (like Texas has) there’s an added layer of complexity and diligence in making sure the correct series of the LLC is named in addition to whether the particular series is member or manager managed. PS You’re probably right about the sole proprietor. It’s the only example where the signatory isn’t acting as an agent. 1. Question: Why is the entity name in all caps in the signature block? Is it because that’s how many (all?) states record entity names? 2. Comment regarding Secretary of State websites: I use these too, and for Delaware I do a free search for the registered agent which is usually enough to confirm the entity name. I find the best source is the contracting party though, so I only look at Secretary of State websites to verify if I think they might not know what they’re doing (the usual giveaway is when they fill in “United States” as the jurisdiction of incorporation). 3. Comment regarding confirming authority: I agree that the person’s title can be a good hint. I’ve had some unusual experience on the other side of this though. In one case, the person’s title was “Director”, as in the corporate title. The other party didn’t think Director was a high enough “rank”. In other case, the other party wanted confirmation that a CEO was an authorized signatory. This lead to the odd situation of a separate letter from the CEO confirming her own authority (no one else was authorized to confirm / delegate authority). This satisfied the other party’s request. Andrew: Thanks for commenting … I’m hoping you’ll stop by on occasion to see whether there are any new and interesting conversations. I’m not sure where the practice of using all caps for entity party names originated. Left to my own devices, I’d use the capitalization and punctuation of the company’s actual name, for example, E*TRADE Capital Markets LLC. I think it’s a person’s prerogative to have his, her, or its name spelled and pronounced however they want. But I’m a firm believer in standards, not just because of perfectionist tendencies but because standards are essential for systemization, standardization, and automation, of which I’m a strong proponent. I think the most promising standards for contract drafting are Ken’s MSCD and the Chicago Manual of Style, so I follow them to the extent I can. Interesting story about the CEO. I guess one person’s due diligence is another person’s funny story. I wonder whether they might have wanted to rope the CEO into personal liability. A really good post – very clear and useful. One minor note – in your limited partnership signing blocks you name the entity as a “Ltd.” in each case. Surely it should be an “L.P.”? Westmorlandia: You’re right! (or “LP” or “limited partnership,” but not “Ltd.”) Thanks for the quality control. Westmorlandia: I believe “Ltd.” is permitted in Texas. See Business Organizations Code § 5.055. It is permitted in Texas, Brian. Hi Brian, I’m too happy to find your article since researching a serious contract problem. What if the names in the signature block and the introduction differ? What if shorthand or dba names are used in each of the two places? What if the human signing is an agent and employee of the corporate party in the introduction but also a director of the corporate party in the signature block? Finally, does it matter if the signature block company is also an occasional employee of the introduction company? Thanks for the interesting write-up on signing contracts – very well written for those new to the game. I have a related question, but it has somewhat of a different spin to it. I have a corporation (not a sole proprietorship) and also have a signed contract with a client to provide services. The contract is valid until the end of this year. The contract was signed 4 months ago. Fast forward 6 months and I get a phone call saying they no longer need my services, they have enough resources, and no longer require me to do the work. It should be noted that I have not received any of this in writing. Now, the contract is most definitely defined as being between my corporation and the other company. I acted as an agent when I signed the contract (as president of the corporation) and was also the one who would do the work stated in the contract, although I do have the option of hiring another person to do the work. However, when I got the phone call, it wasn’t absolutely clear if they wanted to end their ties with the “corporation” or with “me” as an individual (basically an employee of the corporation). Since I also have a shareholder that is an employee of my corporation (my wife), would I then simply be allowed to send them to work under the same contract, since the contract was between the corporation and the other company, rather than just me as an individual? The reason I’m asking this is upon requesting written confirmation from the other company stating what the new terms of the contract are, they have not replied and simply feel that telling the agent over the phone is sufficient. They have not actually ended my contract – they just said “We don’t need you to come in”. As such, and as the president and director of the corporation, I want to protect my interests. For example, if they happen to request work again from me, or my corporation, do I have to oblige them? Since they only told “me” as an individual of their intent to reduce the number of hours in the contract, not the “corporation”, the separation between “me” and the “agent of the corporation” is somewhat blurred? Not getting any written notification is glaring, in my opinion. Who’s to say that on the phone I was told “Your services are not required for now …”, or “Your services are no longer required for the remainder of the contract …”, or “Your company’s services are no longer required …”, etc … with each phrase having slightly different implications. I know it’s hard to glean everything from this short inquiry, but I’m curious as to what your take on it would be. Eiron: Thank you for your kind words. Unfortunately, I can’t comment on people’s specific situations, but maybe someone else will see your comment and be more helpful. Very good article!!! Is a contract valid if it is in your divorced name instead of your legal name? Let’s say my name is Tony Stark. I don’t want to change my name from being Tony Stark, but some people know me as Iron Man. So, in some instances, I want to be able to sign documents as Iron Man without having to disclose that I am also Tony Stark. Tony: My post is applicable mainly to B2B contracts, from the point of view of a counter-party–in your case, the person deciding whether to do business with Tony, or Iron, or Tony d/b/a Iron. The general message is to dig deeply enough to get to the level of comfort you need to pull the trigger on the deal, as well as to ensure the party you intend to be on the hook is in fact on the hook. Can an official document be signed by an organization representative without printing his name? Note that the printed name is missing below. Raghu: As a practical matter, I’d say yes, at least with respect to contracts that are entered into by a company on a mass scale, as with a lot of electronic contracting, which is done automatically by computers. But as the company’s counter-party, you could run into proof issues with respect to the authority of a signatory to sign the contract (e.g., who “signed” the agreement? how do you know they were authorized when you can’t identify them?) I haven’t read any cases that deal with this specific scenario, but cases that involve, for instance, a secretary’s using the company president’s signature stamp would give me pause. Maybe one of the contracts heavy-weights who have commented on the post will provide their two cents. If a contract between a municipality (city) and contractor normally requires the signatures of two officers or principals of a company, but the contractor is a sole proprietor, should he sign the contract twice? This is in California. Thank you. Not unless the proprietor’s name is Vincent Twice. Hi what happens if a person not authorised signs? For example, he might be the owner of the company? Can a DBA be a sole party to a contract? Is a contract binding if the individual who offered it is using an alias and misrepresenting his or her identity? I am curious because as an author I have signed contracts with one individual and have now learned said individual doesn’t exist and is a false name for an actual person. Would the contracts still be binding? Great article. I think there is one notable exception to your rule that the introductory paragraph and the signature blocks should match completely — where a party is added to the agreement by the operation of the agreement. For example, if you have a contract between A and B, and via Amendment #1 party C, a coprorate affliate of party B, is added specifically with the respect of the performance of certain obligations (instead of relying on a subcontracting clause), I would have the prefatory language include parties A and B (present state of contractual parties), but the signature block include parties A, B and C (go-forward state of contactual parties). What about person’s acting in a position that has signature authority? How is this expressed on the signature line, e.g. (John Doe (AA), President) or (John Doe, For the President) or does it really matter as long as you use one of the metjhods above. Appreciate your thoughts on acting As assinmnets and signing Contracts for a Corporation. If what Randall is asking is whether the “official” signer can delegate signing to someone else, and how that someone else should sign, then there’s a good way to do that and a bad way. The good way would be to type the “proper” signer’s name and then add another “by” line underneath, e.g. Widgetco, LLC by John Doe, manager, by Rachel Roe, assistant. The bad way is for Rachel to sign John’s name and put a “/rr” after the signature. Both of these raise questions about authorization, so John should confirm to the counterparty (in writing, including email) that he authorized Rachel to sign for him. What if a company’s formation abbreviation is left off of the official party name? (ie: actual legal name “My Company, LLC”; name as listed on contract “My Company”) Would the contract still be enforceable due to it not reading the legal full name (including the “LLC”)? If a franchise Contract Agreement is signed up, is it valid without the Corporate Secretary or it can be void/null ? Because i did not see this when it the contract is executed. I’m trying to find an authority that says that the signatures must be at the end of a contract, i.e. that a signature signifies acceptance only of what appears above it. It appears that the point is so obvious that it hasn’t been expressed in either statute or case law. Can you give me a hint about where to look, or do you know an authority? You’re not likely to find such an authority because there’s no such rule. Many contracts have cover pages that are signed, and even more have schedules, annexes, attachments, etc. that follow the signature page. It’s a frequent (if annoying) practice in such cases to have each page initialed by the parties so everyone knows that every page has been, if not read, then at least acknowledged as part of the contract. If you’re not the excessively suspicious type you can just skip all that, or just adopt a “page X of Y” convention of page numbering. Exhibits would normally be referenced in the agreement itself, so their presence will be accounted for. Thanks. My real problem is that I have a court order executed on a preprinted form. The judge’s signature block is at the bottom of page 1. In very tiny print, at the bottom, it says, “page 1 of 2”. Page 2 is on the obverse. Page 2 contains a very important clause that conflicts with what the judge fills in on page 1. I want to file suit against the State of California to force it to modify the form so that it is not misleading. The form is a witness/victim protective order. California case law establishes that such orders terminate when the trial court loses jurisdiction over the case. This is stated ON THE BACK of the form, including a citation to the dispositive case. But this information is buried within a full page of much less significant text and is printed in a very light grey ink, suggesting that the back of the form does not contain anything important. The front of the form, above the judge’s signature, states (in handwriting) that the order terminates 3 years from when it is signed. I think that the form is designed to mislead both subjects and protected persons into thinking that that the order endures for 3 years, when it doesn’t. What I have in mind is something like a class action suit or a writ of prohibition filed with the purpose of defending the organic law of the State of California against encroachment by the judiciary. Any thoughts would be appreciated. I agree with Vance. However, I have seen cases which have called into question text that was written below the signatures because it was unclear whether the text was added after the contract was signed. Adding an example for trusts would be appreciated – and is apparently needed from what I see. I often encounter draft contracts between my employer corporation and (simply) “ABC Trust”. The ABC Trust is not a legal entity. To be assured of a binding contract, my preferred practice is to style it: “John Smith, in his capacity of trustee of ABC Trust”. Alternatively, though somewhat more complicated where the trustee itself is a corporation, something like: “ABC Trustco Management Corporation (the “Trustee”), in its capacity as trustee of ABC Trust, by Brian Rogers, President of the Trustee”. Thoughts? does every page of the contract need to be initialed? Anita: It’s not necessary to initial every page of a contract, but it can help prove that each of the pages was attached to the contract when the parties signed it. This is nice info,its helpful.since the only identity of the signatory on the contract paper is his or her signature,how can I be convinced that him or her is putting their true signature minus a witness? Didi: Authenticating signatures is an important issue. The extent parties go depends largely on context. Having signatures witnessed and notarized are common methods of ensuring authenticity. What about digital signatures or clickware? Relatives formed an LLC on some family owned land without my knowledge or consent. They used my Social Security number as my signature of approval. Is that legal? I have never seen or read, much less signed these documents. My grandmother was ill and her home was damaged resulting in an insurance claim. During this time, she asked me to sign all the paperwork for her and take care of the issues. She also signed a letter to the insurance company giving me authorization to sign on her behalf and handle the claim. My grandmother requested some repairs be done that were not covered by the insurance. I asked the representative if I could sign on behalf of my grandmother with her authority and they agreed. My grandmother’s name, property and the company are the only entities mentioned in the contract. My grandmother has since passed away and the company is claiming I am personally liable for the debt. Is this a valid contract and could I be personally liable for the debt? What if an elected official signs a contract to purchase real estate on behalf of a municipality without securing needed pre-authorization? Is the contract valid? Many thanks. Dealing with a law firm (LLC) that insists on signing their documents with the name of their LLC (“Acme LLC”) instead of a member of the LLC (“John Doe, on behalf of Acme LLC). Clint: This is typical of legal opinions, but I don’t know that I’ve seen it in other contexts. What about a corporation who insists on executing real property instruments under its trade name (fictitious business name)? E.g. Little Gas Company, a division of Mega Gas, Inc. In this example Little Gas Company is a fictious business name (and was formerly a legal entity in the state several decades ago, but probably for continuity with customers, successors have taken this name as a trade name). Mega Gas is the legal entity and current owner. Mega wants to sign everything as Little Gas Company, a division of Mega Gas, Inc. Any suggestions or thoughts on whether this compromises our ability to hold them liable? I feel it does. You can’t (at least, not effectively), unless the person is individually named as a party to the contract or is a guarantor of the corporation’s obligations, in which case you’d need language in the contract to make that work. Your examples are quite illuminating and useful. If a deed is to be signed by a partnership firm by a corporate partner (which is represented by its Director) can the following form be adopted. (I am in India, and we generally follow the British precedents). Wd appreciate to receive your expert views. Many car lease contracts have signatures on the front of the contract and then considerable legal text on the back of the contract. It would seem that what is on the back is “underneath” the signature. Among the items on the back of the contract in question is an agreement to arbitrate. Is the agreement binding, given that it occurs after the signature? 2 Part comment. If neither parties involved signature block match the names exactly as in the beginning of the contract is it still valid. And if it is an Electronic signature and the contract is asking for social security number but it is not included is it valid. This is for an entertainment contract. I have very much enjoyed this blog article and comment thread! Very helpful. I have a rather specific question as it relates to a DBA: Let’s say my LLC is called Retail Company, LLC, and my registered DBA for one of my retail businesses is called Bike Shop Company. If Bike Shop Company is having customers sign a Release of Liability to rent our bicycles, should I put in the waiver the actual LLC name or is putting Bike Shop Company sufficient? The waiver is found on the invoice that each customer signs and it features the Bike Shop Company logo (not the LLC name). Would it be confusing to throw the LLC entity name into the waiver since, again, the business is operating as the Bike Shop Company? Or is it preferred to have the actual LLC entity listed in the waiver so as to have it properly protected under the waiver? Thanks in advance! at my job we have work order authorization forms we have the job supervisor or someone from the company we are doing the work for sign as proof the work was ordered and completed. We want to add a line under the signature line but need the proper wording.. stating the above signature is an authorized agent of the company. we need this so there is no problems in getting paid for the work. We are in NY and NJ any advice on wording? Chris, here’s the problem: either the person who signs is authorized or not, or is “apparently” authorized by virtue of position or function within the deal. But saying you’re authorized doesn’t make it so, and not saying it doesn’t make it not so. If you say that the signatory company affirms that the person signing is authorized to do so, but someone unauthorized signs without the company’s knowledge, you’ll have a hard time pinning that on the company; and if the company had knowledge, then that constitutes apparent authority so the company can’t wriggle out. So there’s really no need for a recital of authorization, because either the person was authorized or (actually) had a role that would lead you reasonably to conclude that person was authorized, in which case the company is liable, or the person wasn’t authorized and you had no reason to believe (s)he was, in which case the company isn’t liable. A recital will have no effect on that one way or the other. So here’s the issue: the person signing is not a party to the agreement, so the agreement doesn’t bind him/her. If the parties had thought about it earlier and provided that certain named people were authorized to sign the agreement or the work order, then you have a commitment on those people’s authority and would be justified in not accepting a signature from anyone else. But after the fact, you have to rely on actual or apparent authority, and putting a line under the signature doesn’t really help you against the company. Of course, if you can show that the company led you to believe that they were authorizing the work order, then you have them, on what lawyers call a theory of estoppel. But that’s a doctrine outside of actual contract law. In other words, the lease is between the owner (the LP) and the tenant. The Management Company (an LLC) is merely the agent for the owner. And the property manager who signs the lease is merely an agent for the LLC. they all sign the agreement on different dates and Party B signs the agreement on the date which is the earlier of the dates of execution of party A representatives – which will be considered as an effective date? Only two signatories from party A side executes the agreement, and the agreement is properly executed by party B – is this a valid enforceable contract? Apologies if this question is found irrelevant to the topic of discussion and many thanks in advance for any help on this query. What about consumer contracts? Husband and wife. Can a spouse assign the rights of another such as insurance proceeds ? Is this illegal or make the Contract void? Or would I have to add my personal name somewhere in the signature block? Fantastic post , I loved the information ! Does anyone know where my business would be able to acquire a sample WA DSHS 14-078 form to complete ? I fully understand now how may I sign a contract. Its good to learn all these things. Thank you for sharing your expertise. What if you are signing an employment contract for yourself and you are only representing yourself not anyone else or company would you still say sole proprietor or individual on the designation line. I always assume sole proprietor was one’s self representing their own little business. I do not know what to say. leave it blank? It is important to sign documents online these days. Most contracts do not become legally binding until it has a Esignatures of each party involved. By signing off on a document, it confirms each party’s agreement and intention of executing the terms in the contract. I have a question about a contract. I reached a settlement in an employment case (which stated 15 days to validate). I was first to sign the contract on June 21,2016 and 49 days later I received the settlement checks on August 9, 2016. I then request a copy of all communication with the other party. I notice that on the signature page on the settlement contract, the original name of the HR Manager for other party was crossed out and another name was in its place. I don’t know who that name is. I didn’t sign with that other person name on the contract. All of my communication was with the HR Manager from the start of my first case and that’s who name was on the original contract when i signed it. The name was changed without me knowing. Is this contract binding, valid or legal? And why didn’t my lawyers notice this? I did happen to make a copy of the contract when i signed with the original name on it. Although this information appears to apply to Missouri, whereas I live in Florida. I still found it to be excellent information, thank you. If a business has the legal name registered with the State of Texas as, “Dallas Company” and a different business group has the name, “Dallas Company, Inc.” is that legal? Would I have to reserve both names, if I wanted them both, or is it a given that they are the same, and hence same owner? AND if say….”Dallas Company” got a mortgage, does it have to sign the documents as “Dallas Company” or can it sign its name as, “Dallas Company, Inc.”? OR.. if I have, “Dallas Company” does that mean, NO ONE ELSE in the state can have, “Dallas Company, Inc.” or “Dallas Company, LLC” or Dallas Company, LLP..? Does it matter, or am I being too technical? with the exact same comment. Perhaps there is a means you can remove me from that service? If there is a signature line with my first, middle and last names underneath, do I have to sign my middle name? I never sign my middle name and probably have forgotten how to sign my middle name. ??? ?